Dogs Trust: Blue Peter and Dogs Trust team up! Blue Peter and Dogs Trust team up! This week saw the unveiling of an exciting new addition to our Harefield West London rehoming centre - a Sensory Garden for our four-legged friends! Former Dogs Trust and current Blue Peter dog Barney, who was rehomed from the centre in 2009 by presenter Helen Skelton, had the honour of being the first dog to 'test out' the garden and the film was shown during the show's Tuesday episode. Helen and Barney spent the day getting their hands (and paws) dirty by helping to complete the Sensory Garden, which will provide a rich source of entertainment for the dogs cared for at the centre. “At Dogs Trust, we strive to make life for the dogs in our care as enjoyable as possible and already they benefit from exceptional facilities and incredibly loving staff. All dogs being cared for at the rehoming centre will benefit from this exciting new play area. But for those that have been deprived or even neglected in some way it will be especially important, because stimulation of the senses is a vital part of any rehabilitation programme. A dog paw sensory area featuring a range of different materials and textures for the dogs to explore, including sand, pebbles, bark and water. 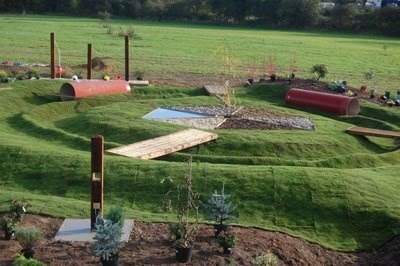 A hilly grass maze containing tunnels and wooden pontoons for the dogs to run over and explore. Interactive games where dogs can seek out toys and treats. Several bedded areas with colourful and scented plants to delight the dogs' senses. A grass bank with logs embedded into it so that when balls are thrown into it, a giant pin ball style game is formed. The Sensory Garden has been funded entirely by donations from kind-hearted animal lovers. We plan to continue raising funds which will be used to install a variety of water features and hope to have this completed in time for summer 2011, so that the doggy residents can enjoy playing in the water during hot weather. We would like to thank the following for their assistance with the project. Head to BBC iPlayer and you can check out the programme free online for the next few days!